KOBANI, Syria -- A roadside bomb in northern Syria killed two coalition personnel, an American and a Briton, and wounded five others in a rare attack since the U.S.-led coalition sent troops into the war-torn country, the U.S. and British militaries and a U.S. defense official said Friday. The military did not say where the attack took place or give the nationalities of the other casualties but it came hours after a local Syrian official said that a roadside bomb exploded in the tense, mixed Arab-Kurdish town of Manbij that is not far from the border with Turkey. Manbij is under threat of a Turkish military operation. Ankara says Syrian Kurdish militiamen it views as "terrorists" and an extension of Kurdish insurgents inside Turkey are in control of the town. 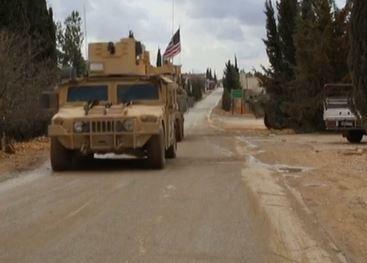 Trump says U.S. forces leaving Syria "very soon"
The U.S. military statement said the attack happened Thursday night and that the wounded were being evacuated for further medical treatment. The statement said details were being withheld pending further investigation. A Department of Defense official in Washington said one of the two killed was an American service member and the other was of another nationality. No other information about the deceased American was immediately available. The official spoke on condition of anonymity because details had not yet been publicly released. A U.K. defense ministry spokesman said the British armed forces member was killed during an operation against the Islamic State of Iraq and Syria (ISIS). The spokesman added that an improvised explosive device killed the service member who was embedded with U.S. forces on Thursday. No details on the casualty's service branch, unit or gender were immediately provided. The U.S. military member killed was the fourth American who has died in Syria since the U.S. began attacking ISIS militants there in September 2014, according to the Pentagon's Defense Casualty Analysis System. Of the three previous deaths, Air Force Staff Sgt. Austin Bieren was specifically labeled by the Pentagon as a non-combat death. Another, Navy Senior Chief Petty Officer Scott C. Dayton, was killed by an improved explosive device. The third, Army Spc. Etienne J. Murphy, died in a vehicle rollover. Earlier on Friday, U.S. military spokesman Col. Ryan Dillon couldn't immediately say who was behind the attack. "There is an investigation under way to identify who they could possibly be. We have our initial assessment and thoughts on that but we won't provide until the investigation is complete," he said. Dillon declined to give the nationalities of the dead and wounded as well as the location of the attack until next of kin notification. Dillon said the coalition has had fatalities in Syria before. "Perhaps by different means but there have been coalition deaths in Syria over the course of three years." Mohammed Abu Adel, head of the Manbij Military Council, an Arab-Kurdish group in the town backed by the U.S., said the bomb went off hundreds of meters (yards) from a security headquarters that houses the council just before midnight on Thursday. Earlier on Friday, Dillon said an incident involving coalition forces was reported in Manbij but said no more information was available. The town has seen a number of small explosions, protests and an assassination attempt on a member of the Manbij military council in recent weeks. Local officials blame Turkey and other adversaries for seeking to sow chaos in the town that was controlled by Islamic State group militants until the summer of 2016. The military council has since been in control and U.S. troops patrol the town and area with troops based nearby. Meanwhile, near the capital Damascus, there were conflicting reports on whether a main rebel group will evacuate the largest and last rebel-held town in the area, known as eastern Ghouta. Col. Gen. Sergei Rudskoi of the Russian military's General Staff said at a Friday briefing that the agreement envisages Army of Islam rebels and their families leaving the Syrian town of Douma, just outside of Damascus. The announcement came after the Syrian government on Wednesday issued a three-day ultimatum to the Army of Islam group to leave Douma or face an all-out offensive. Syrian state TV said an agreement is about to be reached for an Army of Islam evacuation but the group denied the reports. Army of Islam military spokesman Hamza Bayraqdar told The Associated Press that the reports are false, adding that his group's stance is to reject displacement and demographic change in eastern Ghouta. The Syrian government and the Russian military backing it have demanded that Army of Islam members leave the area for northern Syria, following other rebels who left eastern Ghouta. The Syrian Arab Red Crescent said Friday one of its convoys entered three towns in eastern Ghouta bringing badly needed food supplies to residents after opposition fighters left the area. SARC said it entered the towns of Saqba, Kafr Batna and Ein Tarma in eastern Ghouta with mobile water tank, mobile clinic and relief aid convoy of 16 trucks loaded with 8,500 bread bags, 5,000 food parcels, water bottles and nutrition items. It said the supplies were provided by International Committee of the Red Cross and the World Food Program. Rudskoi said over 143,000 people, including 13,793 rebels and 23,544 members of their families have left eastern Ghouta. He also said some 40,000 residents have returned to their homes in eastern Ghouta as there has been no fighting over the last seven days.